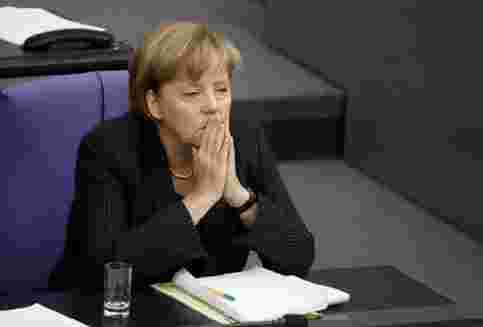 Berlin: Germany’s parliament approved new powers for the euro zone’s crisis fund on Thursday but it was not clear if Angela Merkel got enough votes from her coalition to silence rebels worried about funding a series of bailouts of countries like Greece. The Bundestag’s (lower house of parliament) deputy speaker Wolfgang Thierse said 523 lawmakers had voted for the bill, 85 against with only three had abstentions. If a breakdown of votes expected take up to an hour more shows the bill only got through thanks to the centre-left opposition, it would undermine the conservative chancellor’s ability to pilot fresh measures to combat the euro crisis. Merkel had tried to assure her coalition that taxpayers’ money would not be wasted by supporting bailout measures -- but she could not rule out that the money might be written off if, as financial markets increasingly fear, Greece defaults. Germany will shoulder up to €11 billion of the fund’s €440 billion worth of guarantees, but critics fear it is already clear this will not be enough and taxpayers will be asked for more. That impression was reinforced by talk at the International Monetary Fund last weekend of the need to beef up the EFSF even more -- on top of the extra powers decided by European leaders in July -- by leveraging its capital and bring forward the permanent scheme supposed to replace it in mid-2013. “We’re borrowing money from our children to put in a showcase and it is money that we don’t have," said one rebel in Merkel’s Christian Democratic Union (CDU), Klaus-Peter Willsch. Merkel is often accused in Europe and at home of dithering on the euro crisis and if she did not win the EFSF vote on her own terms, it would damage her hopes of taking the conservative bloc she has led for 11 years into the next elections in 2013. With a core of naysayers in the CDU, its Bavarian allies the CSU and the FDP, the vote was being scrutinised to see how close Merkel got to a convincing 311 ‘yes´ votes from her own bloc in the 620-seat Bundestag. Sentiment remains divided. Even though labour unions called on MPs to back the measure, the conservatives’ “Mittelstand" small business alliance had urged MPs to vote ‘no´. The opposition Social Democrats (SPD) and Greens have won a run of state elections this year and, with two more votes in coming months on the second Greek bailout and a permanent mechanism to succeed the EFSF, portray themselves as defenders of the single currency. With the FDP’s popularity sliding to just 2 percent in some recent polls and state elections, and the party increasingly critical of euro zone bailouts, it often appears more of a liability than an asset for Merkel.